Television debates aren’t perfect. But, as the Guardian says, they get people interested in the election and the issues. That’s something we desperately need. The Scottish independence referendum showed that people still care about politics when there’s a real choice. And when politicians and people debate passionately the future of their country. The crying shame is that politics in Britain has become both trivial and predictable. Critics often dismiss Cameron as a smooth PR man. As someone who has working in PR for 27 years, I find that a lazy jibe. 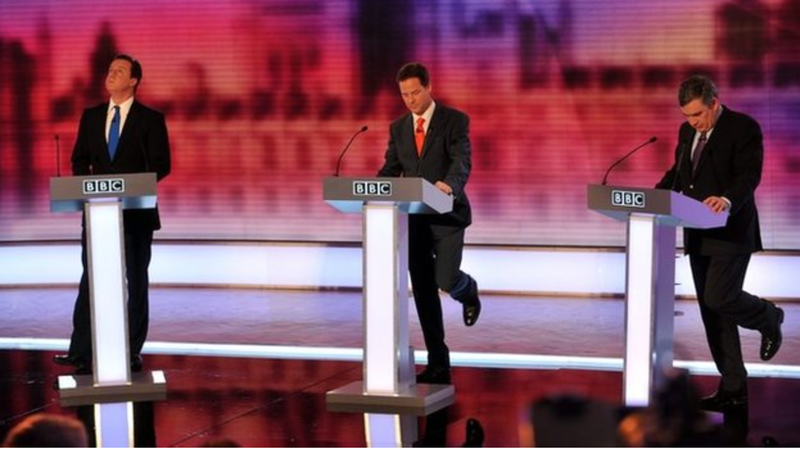 His performance over the leaders’ debates suggests he couldn’t have been very good at PR. The most junior PR adviser would have told him he was making a big mistake. They’d have warned him that critics would replay his comments welcoming the 2010 debates. (“I’ve always wanted these debates to happen. I mean, they happen in every country. They even happen in Mongolia, for heaven’s sake, and it’s part of the modern age that we should be in.”) And they’d have urged him to seize the opportunity to tell a compelling story about a reviving economy. Instead, he has made the huge mistake of looking scared and arrogant, incompetent and dictatorial, all at the same time. I’m sure Cameron’s tactics have been prompted by the belief that the 2010 debates cost the Tories a majority. That view is surely wrong. Those debates gave rise to Cleggmania – yet the Liberal Democrats didn’t live up to the wilder predictions of success seen in polls taken at the height of that mania. I suspect Britain wasn’t convinced that the Tories had changed and not enough voters trusted them. The overwhelming lesson of the debate fiasco is that neither politicians shouldn’t decide if and how they should happen. (Especially in an era of multi-party politics.) As the Guardian argues, it should be the responsibility of an independent, impartial body like the US Commission on Presidential Debates. That organisation “was established in 1987 to ensure that debates, as a permanent part of every general election, provide the best possible information to viewers and listeners”. Amen to that. PS: this week of despair followed the previous week of despair when Labour bribed voters with a cut in university tuition fees benefitting well off students and the Tories bribed rich pensioners with special bonds. You’d think the country was awash with money. Heaven help us. This entry was posted in Media, Politics and tagged David Cameron, General Election 2015, Leaders Debates by Rob Skinner. Bookmark the permalink. Oh Rob, only weeks of despair ! Save for a special few, of all flavours & hues, they are a total waste of time & space.